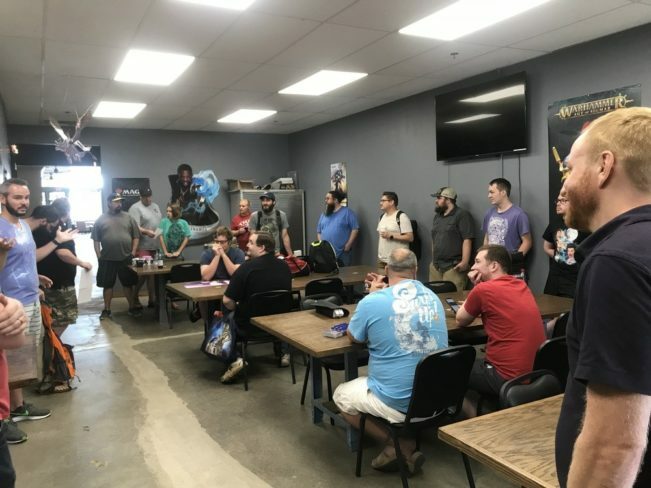 After what felt like an eternity, Fantasy Flight Games posted their first Destiny preview article in nearly three months last week! Shortly after, we received a few Across the Galaxy spoilers mostly featuring characters from the Solo movie, which we discuss in depth on The Covenant Cast today. You can see them below. 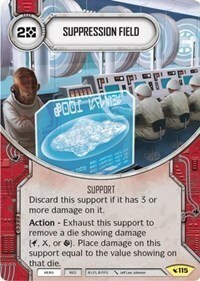 At first glance, the most important card of our Across the Galaxy spoilers seems to be Double Down. My initial thought was to include three copies of Sith Holocron and a powerful force ability. 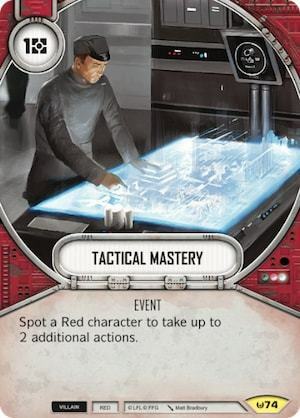 As I had more time to think about the card, I can’t help but think it will be a critical card for any combo deck (like the one turn kill Launch Bay deck) moving forward. While I am certain there was a time in my life where I would have spent the past week trying to ‘break’ Double Down, I decided it would be more fun to showcase a few decks with Tobias Beckett. Of all of the characters from Solo, Beckett was one of my favorites (right behind Qi’ra). I decided to build two decks, the first being a thematic deck, pairing him with Han, and the second being a ‘serious’ deck (whatever that actually means) featuring Arihnda Pryce and Mother Talzin. The deck is all about both characters ability to control resources. In your opening hand, the one card you are definitely looking for is Cunning. I recommend playing it on Han, so that it makes Beckett look like less of a target. From there, the options vary wildly. With Beckett’s power action and special, the deck has the ability to ramp resources quickly. There are plenty of upgrades to take advantage if you do ramp and a few powerful control options too, like In The Crosshairs. The deck can also play a mean resource denial game, pairing Han’s and Beckett’s special with cards like Confiscation or Blackmail. While it is less thematic, the consistency of Emperor’s Throne Room in this deck cannot be overstated. Unless your opponent has a deck that relies on special symbols, it almost forces them to take their battlefield. If you win the roll off or if they are brave enough to take your battlefield, being able to trigger either special at the end of the turn makes late turn resource gain not really an option for your opponent. With a more competitive lens, I doubt Beckett’s optimal use is playing him as an elite character. At 11 points, and as much health, his power action is enough to make him a viable character at one die for the same reason that Rey + Aayla starting a game with three resources via Profitable Connection is so good. Anytime I am looking to take advantage of a static ability or power action with a single die character, my first check is to see if I can play all three colors and have at least three characters. You could run an elite 19 point character, but two characters and three dice seems to be the least viable archetype in the game right now. You don’t get the benefit of multiple bodies on the table and you start with so few dice, it is too easy for your opponent to control you out of the early game. As it happens, Beckett can be played alongside two of the best characters in the game and play all three colors. The first draft of deck is below. 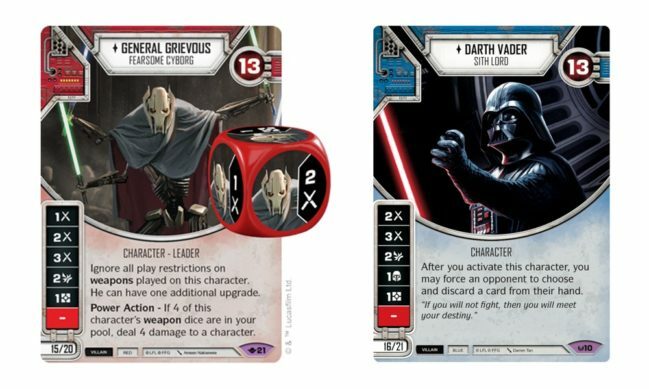 As is the case with any deck, the one card you are definitely looking for in your opening hand is Sith Holocron. One of the issues with a Holocron deck is what happens if you don’t draw it in the early or even mid game. 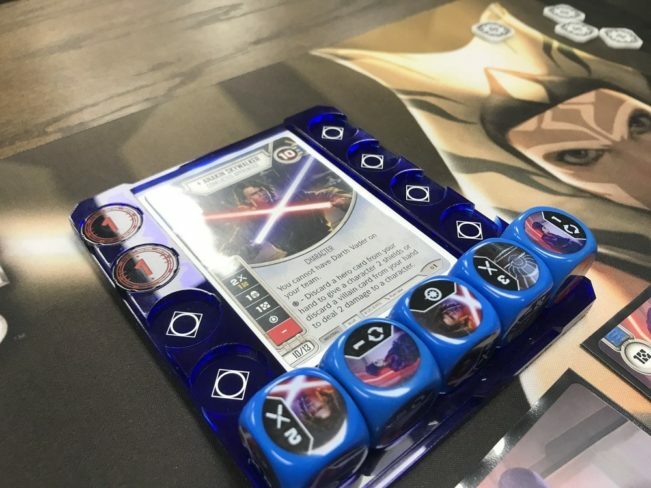 In this case, you have Beckett’s ability, Talzin’s die fixing, and Arihnda’s special to make sure you can get to three plus resources on the first turn. This means you guarantee you can play Command Shuttle or one of the three cost Force abilities on the first turn. If you do draw Holocron, the only character you don’t want to upgrade is Talzin. I would likely upgrade Beckett first, putting a target on his head. Ending a game with Talzin or Pryce and a few good upgrades is hard for most decks to overcome. The deck also includes three upgrades with Redeploy, so you can take advantage, in the long term, of cheating out upgrades with Holocron. One of the spicier cards in the deck is Command Shuttle. This makes me really want to end a game with Arihnda on the board, since between her die and a single Command Shuttle you are able to really dish out some consistent damage. Any time you can have damage showing without actually having it showing (her ability to turn a die to a side of your choice and resolve it), it makes the one on one end game a real pain for your opponent. 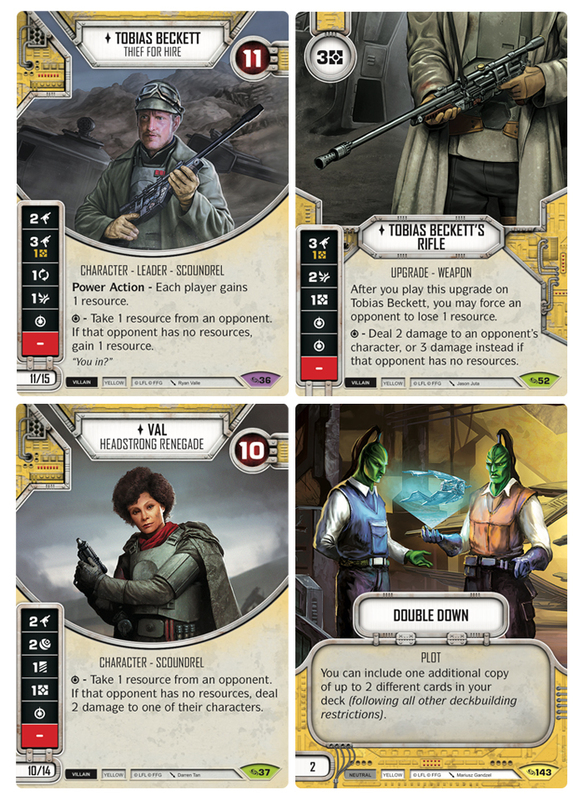 What’s your favorite Across the Galaxy spoilers so far? Would you change anything about either of my decks? If so, I’d love to hear your thoughts in the comments below! While we don’t have a release date for Across the Galaxy, we can’t help but feel like it’s imminent. If you want to automatically receive your booster boxes for Across the Galaxy at the cheapest possible price with free shipping, now is the time to sign up for a booster box subscription. If you want to skip the boxes and guarantee you get everything with an Across the Galaxy Saga Set, be aware that we are almost sold out! Posted in Star Wars: DestinyTagged AnalysisLeave a Comment on Is Snoke Overrated? Legacies Update – Boxes and Sets Shipping Now! Legacies is here – and with it a swirl of information. This is what you need to know. Booster Boxes – We have a limited quantity of Legacies Booster Boxes immediately available for $99. Every order placed with us ships out in less than 24 hours (excluding weekends) and generally arrives within 2-3 business days to the continental US. If you missed out on a subscription in time for Legacies, or are facing shipping delays from other retailers, these boxes are the best way to start diving into the set as soon as possible! Subscriptions – All Booster Box Subscriptions have been shipped! We have also lowered the price of Booster Box subscriptions to $99/box, and have automatically applied this price reduction to every current Booster Box Subscription. Thank you for the support over these past few sets! If you would like to automatically receive Booster Boxes from future sets, guaranteed, within a day or two of release, at the lower $99 price, without ever having to worry – now is the time to lock it in! Slots are limited! Saga Sets – The first batch of Saga Sets shipped today, and, at our current production rate, every set will be shipped by Jan. 22nd – a little over one week after release. We are thrilled to see continued improvement on our Saga Set delivery timelines, and will continue working around the clock to get everyone their sets. 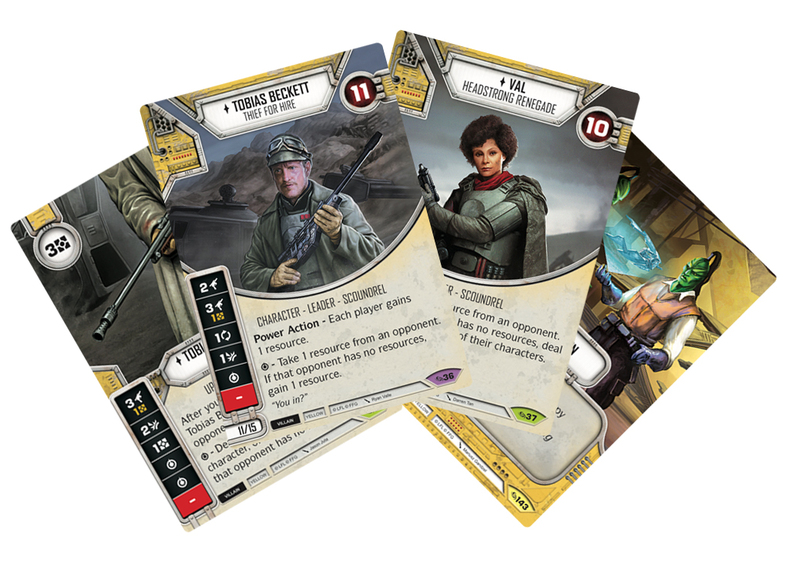 If you would like to be notified whenever Saga Sets for the next Destiny set are up for sale, join our Star Wars: Destiny newsletter. Massive thank you to everyone who trusts us to deliver on their Destiny needs. We just started filming our Learning Destiny series today, and it looks to be our best one yet. Expect to see those blogs and videos in the next few weeks, and with them, hopefully, an influx of new players. Meantime, enjoy Legacies! 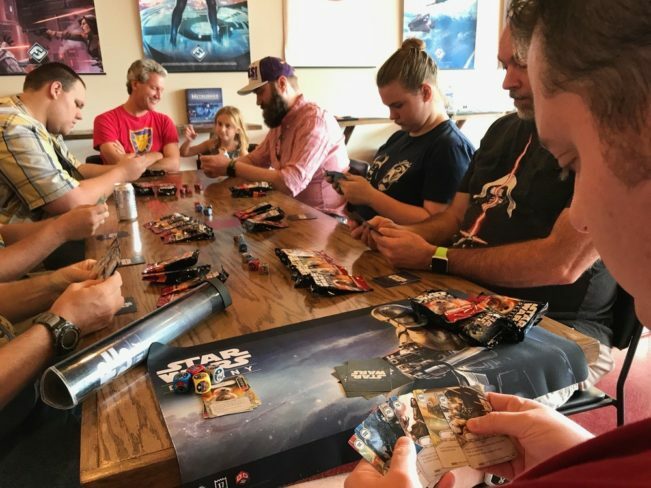 Posted in Star Wars: DestinyTagged AnnouncementLeave a Comment on Legacies Update – Boxes and Sets Shipping Now! Since the release of Spirit of Rebellion, I have persistently been asked one question more than any other… Is Poe Maz broken? Should it be banned? Poe Maz is a deck in Star Wars: Destiny that consistently pulls off crazy turns. It is a fairly easy deck to play, so a lot of players have been showing up to local tournaments and Store Championships with the deck. Many of them have been winning. A lot of players believe the deck is warping the meta and keeping a lot of good characters out of the game. They are starting to push for the deck to be officially dealt with through ban or errata by FFG. In my nearly 20 years playing card games competitively, I’ve seen this scenario over and over again. A new set of cards comes out and a powerful deck emerges. The deck is popular at tournaments and starts winning quite a bit. Old decks get pushed out of the meta because they can’t keep up with the new deck. Since the deck upends the previously powerful decks, players start to question if the new deck is “too good”. Most of the time, these disruptive decks are easy to build and play. After losing to seemingly lower-skilled players “getting lucky” with the new deck, experienced players start pushing for ban or errata. If a deck can win without skill or experience, there is a problem, right? Even when playing in a non-competitive environment, there are few things as frustrating as losing to an inexperienced player simply because their deck is disproportionately powerful. I have lost many games to players who did not even realize why they were beating me. It is maddening. This feeling cuts even deeper if the new deck makes the characters or decks you enjoy playing suddenly not viable. If it takes your favorite style of play out of the game, it may even force you to take a break or quit the game entirely. At some point in this cycle of frustration, it is normal for players to start using the deck in order to learn why it is winning. This is what I started doing with Poe Maz, and I have some bad news. If losing to Poe Maz evokes feelings of rage and fury, playing with the deck will only make it worse. The decisions with the deck are linear, meaning that they are simple “yes or no” questions that can be answered without much consideration for future lines of play. The realization that it is not even difficult for opponents to crush you with this deck makes each loss more painful. If it weren’t for my being tempered by these fires many times before, I would be as frustrated as the rest of the community is with Poe Maz. It is undoubtedly justified. But I have learned that approaching these kinds of decks in new ways often allows you to overcome them. Is that the case with Poe Maz? Let’s take a look. My first step to solving this kind of problem is usually by going to the math. I don’t trust my memory, as it can be deceivingly gray. So, what are the odds of Poe Maz resolving a special on any given turn? Poe has a 16.6% chance (1/6) of rolling a special on his die, meaning the odds of one of his two dice coming up special when he activates is about 30%. Maz has a 53% chance of rolling at least one focus. Since she can immediately resolve two dice, rolling a Maz focus while you have a Poe die in play lets you trigger a special. After activating both characters, the deck has roughly a 70% shot of either rolling or resolving a special side with Poe. When they do hit a special side, we also have to consider the odds of them having the right card to use with Poe’s ability. If they have 12 cards in their deck to use with Poe, that means 40% of their deck are suitable cards. Since they draw five cards, they have roughly a 94% chance of drawing one of those cards in their opening hand. With a mulligan, the odds of them missing twice is only 3.6%. This deck will have a Poe-ready card in hand at the start of the game. The odds of having two are nearly as high as long as one is drawn pre-mulligan. So, how bad is it when they get to resolve both Poe specials? I like to consider the absolute worst case scenario. Let’s say that Poe activates and gets double special. On his next action he resolves both dice, triggering two thermal detonators. If we have two characters on the table, we take 12 damage. Maz rolls in and gets both ranged damage, immediately triggering both with her ability. Our opponent plays Planetary Uprising and is able to claim the battlefield on their fifth action, forcing us to deal two more damage. That’s 16 damage on turn one! It only takes losing to this kind of turn once to start to wonder if this deck is actually absurd. Most decks could not pull this kind of turn off even if they could pick the cards they drew and the dice they rolled. Combine a Rocket Launcher, Millennium Falcon, U-Wing, or Thermal Detonator with any of the others in a single turn and it is still brutal. If I look back, these are the memorable games.This is also why I don’t trust my memory. The more realistic and consistent results blend together and tend to blend in instead of stick out. We can all agree, Poe Maz has absurd turns. The question is what can we do to make that freight train not run on time, every time? As I started my actual testing against Poe Maz, a lot of weaknesses of the deck starting coming to light. The first weakness I noticed is tied to what I mentioned earlier, which is that the deck is very linear. While this makes it easy to play, it also makes it easy to predict. The deck’s strongest moves are obvious and if you know them, become easier to prevent. The second weakness is how reliant the deck is on Poe. If you look at the average Poe Maz deck list and swap out Poe for any other character, it is painful how bad the deck actually is. Consider from our earlier example that 40% of cards in the deck are specifically for Poe’s ability. Those cards becomes dead weight if they cannot trigger Poe. It also means that if we defeat Poe, the match becomes a nightmare for them. The final weakness that really stuck out was how low the damage curve of the deck can be if I could contain it. If I prioritized mitigating Poe’s dice over building my own board through upgrades, I could frequently make them have less optimal turns. Not only could they not do enough damage to defeat my characters faster than I could defeat Poe, but their hand would often get cluttered with big cards they wanted to use with Poe. As I continued testing against Poe Maz, I was amazed at how many opportunities the deck gave me to stop them from pulling off absurd turns. It became very rare that they had those game ending, insane turns. Of course, if they played Hit and Run, had two powerful cards in their hand to use with Poe, and rolled well enough, they could be unstoppable. Even so, I was sometimes able to recover from those turns and win the game. Sometimes. After nearly a month of testing, I have a lot less respect for Poe Maz. If they can fire with Poe, they can do a ton of damage – maybe even more damage than any other deck in the game. However, when I can mitigate or contain them, the deck putters. I played against it with all of my active decks (about nine currently) against the best local opponents. I was met with varying levels of success, but success nonetheless. I tracked my games specifically against this match and was never under a 50% win rate with any of my decks. As you may notice, this deck only has eight upgrades. I started exploring the idea of lower upgrade counts in decks and recently wrote a blog about evaluating upgrades. My style of playing Destiny using this evaluation methodology allows my decks to easily follow the guidelines I set for navigating the Poe Maz match, which may be why I have had success against the deck. At the Store Championship, I ended up facing off against Poe Maz twice in Swiss and in the best of three finals. In each match, I followed my guidelines and had relatively easy matches. The finals games were closer, as my opponent Frank was better with his Poe Maz deck than most. I even think Frank could have won one of the games, but I ended up sweeping the finals. Looking back, my deck is suited to do well against Poe Maz. 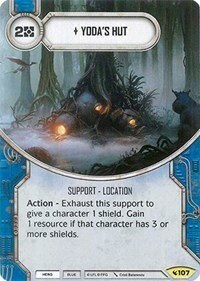 Two character decks are almost a necessity given the prevalence of Thermal Detonator. Guardian on the Royal Guard lets me control a Poe die for free if he rolls damage. 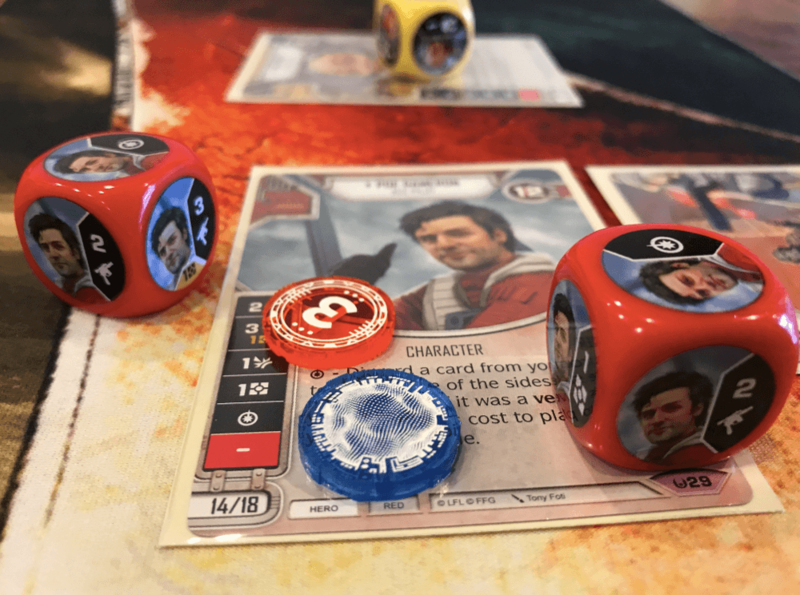 Removing even one of Poe’s dice a turn really slows the deck down. The damage curve of Vader/Guard is also difficult for Poe Maz to deal with, and Vader has enough health that Poe cannot defeat him quickly – even on those big turns when everything goes right. In the meantime, Lightsaber Throw, No Mercy, Force Strike, and Price of Failure gives the deck the ability to outpace Poe in the damage race. Once Poe goes down, the game is usually over. Do I think Poe Maz should be banned or errata’d? These options are two of the strongest tools developers have to ensure a game is healthy, but both should be used with caution. While Poe Maz is a potent deck, it is also predictable and one dimensional. The vast majority of the decks I see already have the tools they need to win against Poe Maz. While they have the capacity to adjust, they continue to spend their money on upgrades early and allow Poe multiple chances to trigger his special. Before pushing hard for technical solutions to Poe Maz, we should be asking ourselves how we are adapting. Are you still playing a 2-cost upgrade every turn, leaving no resources for control? Are you still re-rolling those Discard sides instead of pulling cards out of hand? Are you waiting for a good result to show up before attempting to control dice? Are you trying to resolve every one of your dice before claiming the battlefield? I have yet to solve the “Poe” problem for each of my decks, but I am confident that most decks can figure out how to consistently make a game of it. I strongly encourage you to consider how to play to the weaknesses of Poe Maz the next time you are paired against it. If we adapt to Poe Maz by changing a few basic ideas about how to play Destiny, I believe we can end the reign of terror Poe Maz has on our meta. If the argument is that Poe Maz should be banned because it is too good or unbeatable, I do not think there is sufficient evidence to back up this claim. There is a more conceptual argument in favor of ban/errata, though, and it centers around the game becoming more enjoyable and dynamic without Poe Maz in the meta. I’ll leave that blog to Steven! One final note, we are now pre-selling our final wave of Spirit of Rebellion and Awakenings Saga Sets and Booster Boxes. This will be the last chance to get these cards before they are out of print. The tools in these sets are going to be critical for beating Poe Maz and other powerful decks in the future, so snag them now if you can! Posted in Star Wars: DestinyTagged Analysis27 Comments on Is Poe Maz Broken? 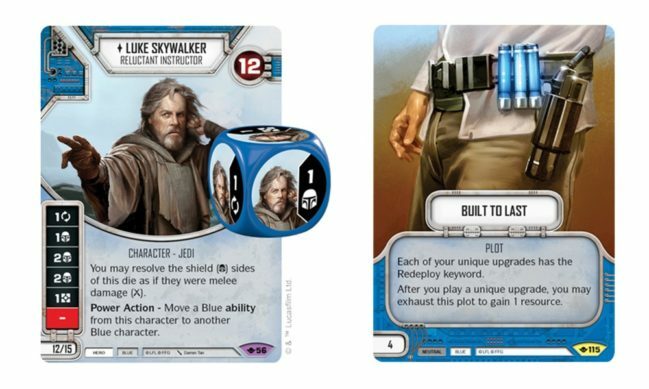 Are upgrades worth playing in Star Wars: Destiny? I found myself asking this seemingly preposterous question as I was driving home after a late night Destiny Worlds testing session with Steven. If I’ve learned anything over the years as a card game player, it’s that you must constantly discover and test your own assumptions. Assumptions are very deceptive, as they are often made without conscious realization. As assumptions are created, deck building and play narrows. Since you are seeing the game through your own lens, it creates a self-fulfilling prophecy that can entrench you in your own thinking. 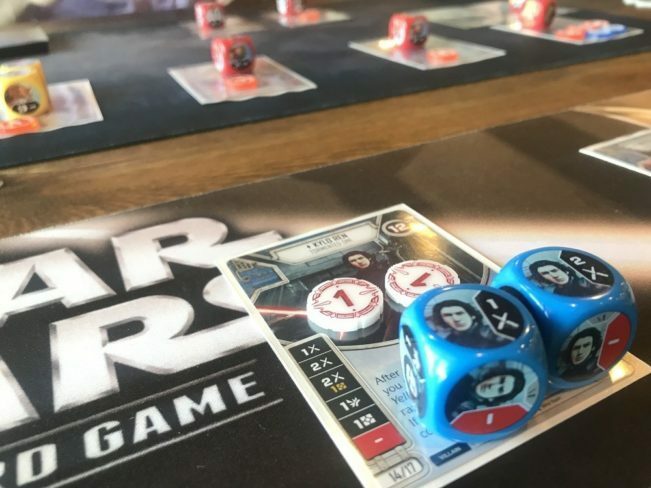 Undoubtedly, dice are an important part of Star Wars: Destiny. Assuming upgrades are worth playing is only logical. If you play a game with a starter, you quickly realize the difference between Rey and Rey with Rey’s Staff. The upgrade advantage is obvious. It was still a few months before the 2017 World Championship, so I decided I would take the time to test my own assumption that upgrades were important and necessary in Star Wars: Destiny. I thought back to early games that I was able to win with Darth Vader even when I did not draw upgrades. I thought of these games as flukes and attributed them to luck. That is a great place to start testing assumptions. I decided to start by attempting to replicate those early ‘fluke’ games. I built a deck with Darth Vader and swung the pendulum as far to the other side of convention as possible. No upgrades. Zero. I won games. A lot of them. After a week of testing, I was starting to become obsessed with the idea. What other assumptions had I unknowingly made?Was everything I thought about Star Wars: Destiny wrong? Everything had to be reconsidered, and I started laying down a new groundwork for evaluating cards. 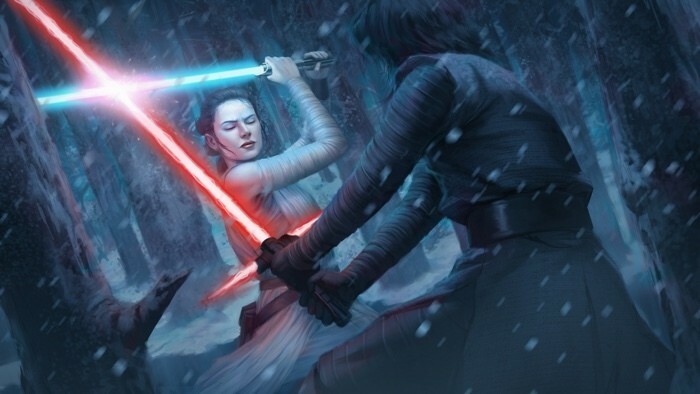 In this post, I consider a new method for valuing upgrades in Star Wars: Destiny, show how it evolved the Han + Rey deck I played at Worlds 2017, reflect on what I would have changed about my deck with perfect information, and consider if this valuation method is relevant as Destiny expands. 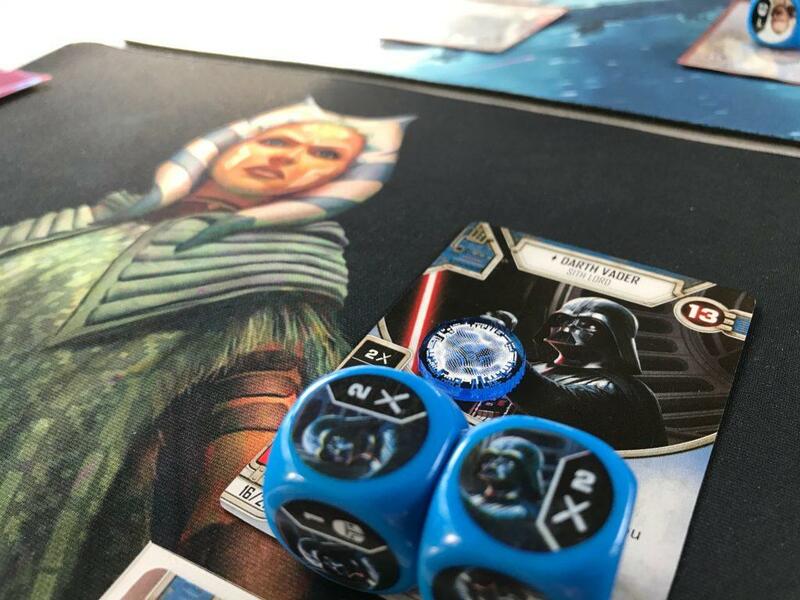 So, why was my upgrade-less Darth Vader deck winning? Winning without upgrades went against a lot of my preconceived notions about Destiny. To understand why I was winning without them, I had to better understand two critical concepts about Destiny. These concepts are the resource and damage curve. I would like to walk through a ‘typical’ game of Destiny to showcase these concepts. 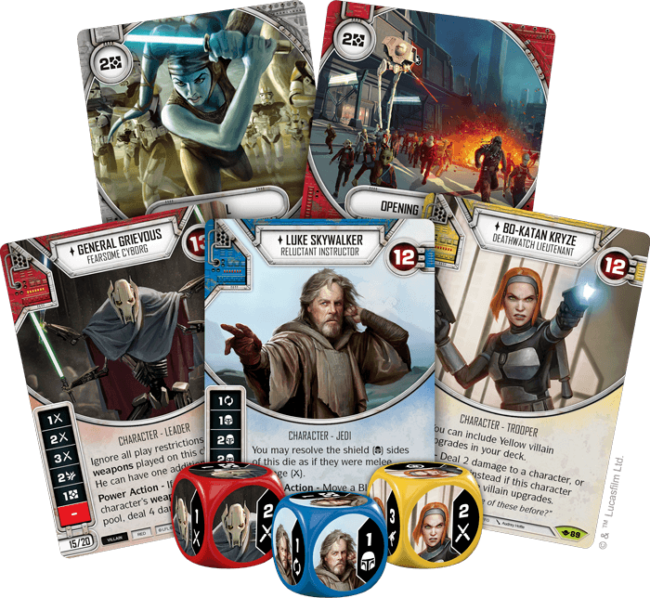 Note that the goal is not to accurately represent the stats of a particular deck or character, like the average damage a Han + Rey deck will do in a game, but to illustrate foundational concepts. So, let’s say our game is going to last five turns. 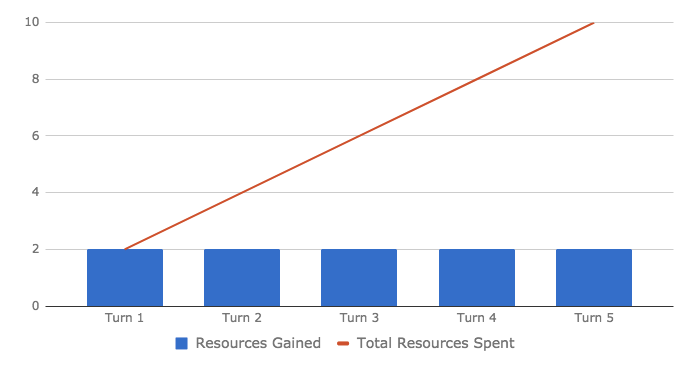 The resource curve is how many resources we are able to spend each turn. Every turn, we gain our standard two resources. 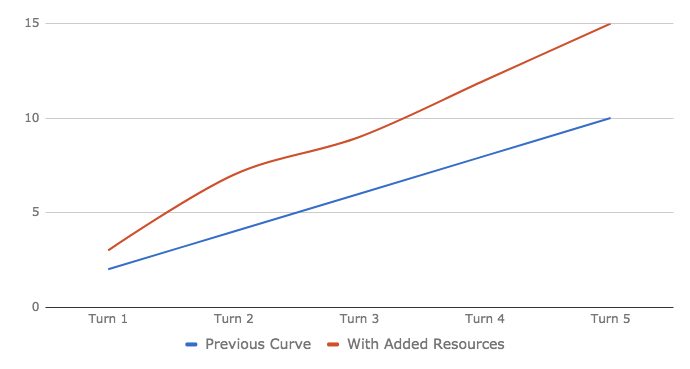 If we are able to spend both resources each turn, our resource curve is below. This curve assumes we won’t gain additional resources in the game. If our characters are Han and Rey, how might we expect this curve to change? Since Han has two resource sides and Rey has a resource side and a +1 resource side, it is likely that our deck will generate additional resources. The pair could generate as many as four additional resources a turn, but for this exercise we will say they generate an additional 1, 2, 0, 1, and 1 resources throughout the game. Below you can see the resource curve with and without the added resources. At some point in the game Han or Rey will probably be defeated. Losing a character means their dice are forever removed from the game. This will affect our resource curve, but how might we project when we could lose a character? Similar to the resource curve, the damage curve represents how much damage a deck does each turn of a game. If we are playing against a Darth Vader + Tusken Raider deck, for example, we might expect Darth Vader to average 2 damage per die and the Tusken Raider to average 1.5 damage per die. If those averages hold, the damage curve of that deck would look like the below. Before we get too far though, we must first consider our own damage curve. If we defeat one of our opponent’s characters, this will surely alter their damage curve. To understand when we might defeat a character, let’s consider our own averages. Han has a 2 ranged damage and 3 ranged damage (costing 1) and Rey has a 1 melee damage and a +2 melee damage. For our exercise, let’s say we expect Han to average 2 damage per die and Rey to average 0.5 damage per die. Our damage curve using these averages is shown below. 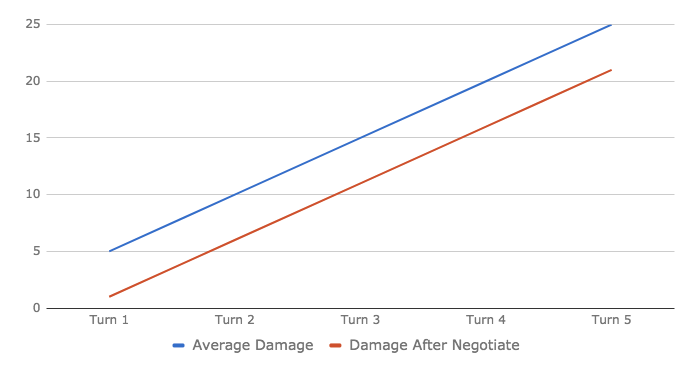 While the damage curve of the decks are close, we must make one further consideration. The health of the characters. With these curves, the Vader + Raider deck could do enough damage to defeat Han or Rey by the second turn. Meanwhile, the Han + Rey deck could defeat the Tusken on the second turn or Darth Vader on the third turn. Given our understanding, let’s say we decide to attack the Tusken Raider first to ensure we can defeat a character. Our opponent, fearing shields or a Second Chance being played on Han, decides to attack Rey first. If our predictions about these curves is correct, on the second turn they defeat Rey, we defeat the Tusken, and we get a damage or two on Darth Vader. 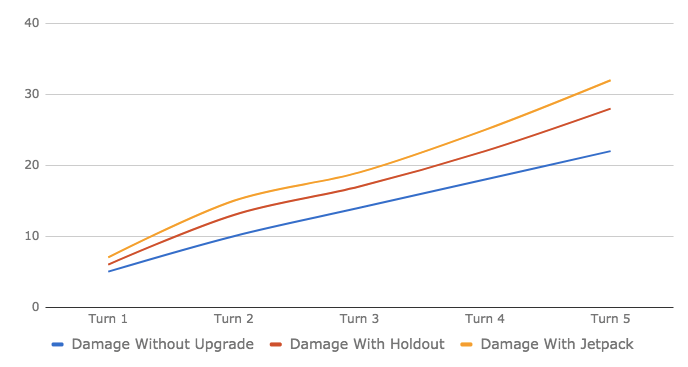 Given that we expect to lose Rey on the second turn, this affects both our resource and damage curve. 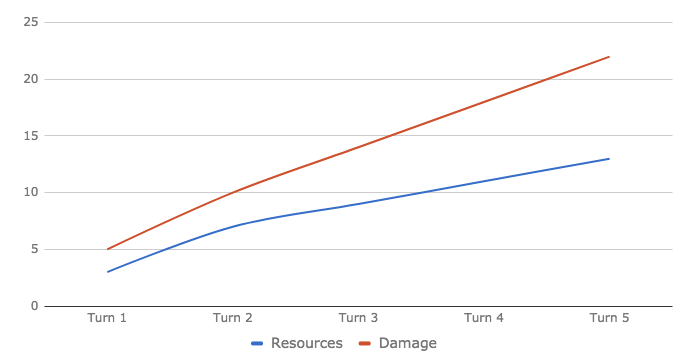 Below I show both our resource and damage curve if Rey gets removed on the second turn. With an understanding of the resource and damage curve, we can now truly evaluate upgrades in Destiny! Let’s consider how our curves might change if we spend our first two resources on an upgrade. 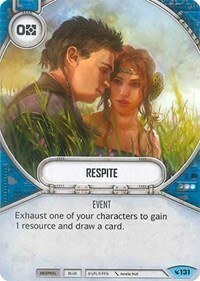 What happens if we play a Holdout Blaster on Rey on the first turn? If the blaster adds 1, 2, 0, 1, and 2 damage throughout the game, our damage curve now looks like this. It is worth noting that we would also get to put a shield on Han because of his ability. 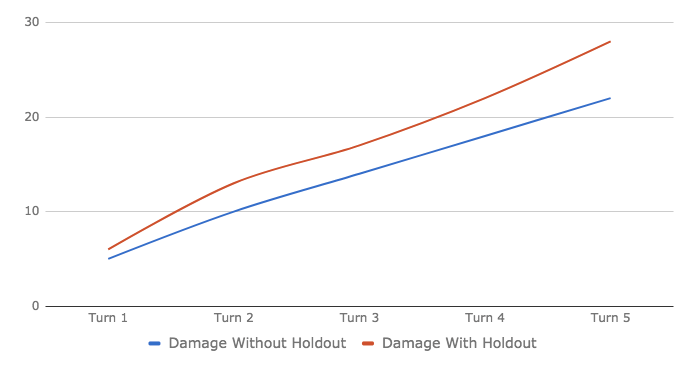 Not only does the Holdout Blaster increase our damage output, but it may even buy us an extra turn with Han given our opponent’s average damage curve! Now, let’s compare the Holdout Blaster to another common upgrade, Jetpack. 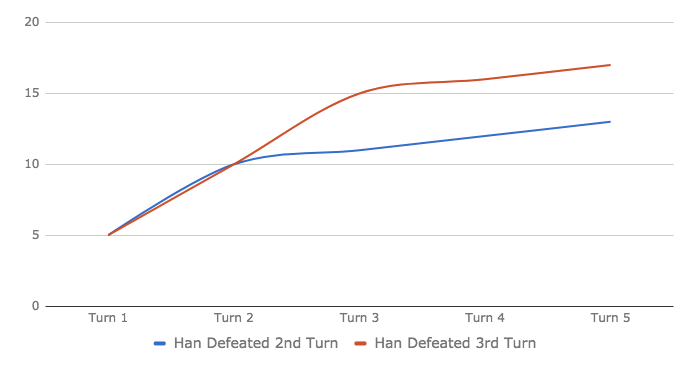 What would our curve look like if we had instead opted to play a Jetpack on Han on the first turn? Not only would this make Han a more attractive target, it would also potentially spike our damage curve even higher. Let’s say that the Jetpack adds 2, 3, 0, 2 and 3 damage throughout the game. Below are the damage curves with no upgrades, Holdout Blaster, and a Jetpack. As you can see, both upgrades increase the damage curve quite a bit. 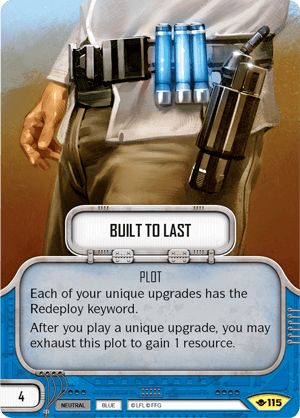 Comparing the Holdout Blaster and Jetpack is important, both in deciding which to include in your deck and which to play given the current board state. However, it is at this point that I believe most players are taking a leap of faith. While we are comparing upgrades to each other, most players are failing to compare them to the rest of the cards in their deck. Have you ever compared an upgrade and a control card? Say, a Holdout Blaster or Jetpack to Negotiate? Both cards occupy the same slot in your deck, so why wouldn’t we compare them? The trouble is, how do we compare them? They fill two seemingly different roles in our deck. For the sake of this exercise, let’s see if we can. 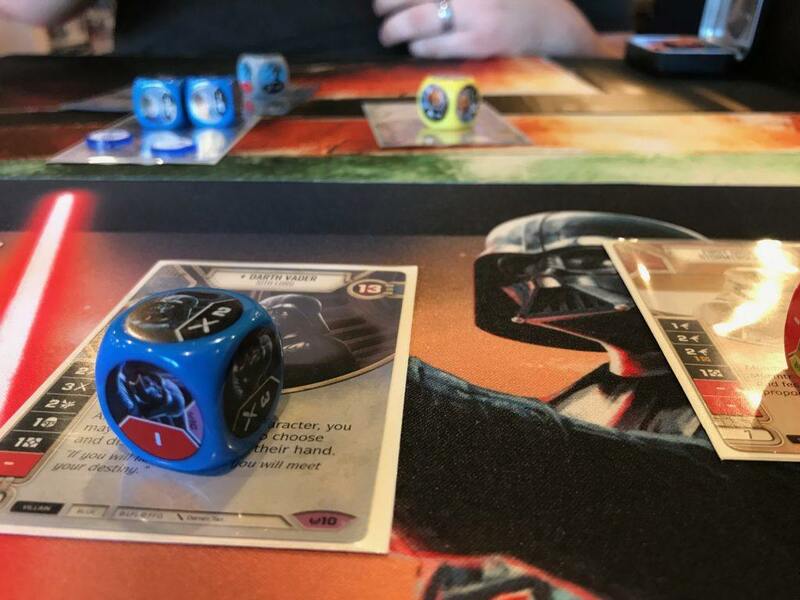 What happens if instead of playing Holdout Blaster on the first turn, we had removed a Rey die and spent a resource to play Negotiate to remove both of our opponents Darth Vader dice? We are down a resource and a Rey die, which averages 0.5 damage. We also cancel an expected 4 damage from Darth Vader. The change to their damage curve is shown below. This doesn’t really help us compare the Holdout Blaster to Negotiate. One is adding damage, the other is preventing it. However, I believe we are closer to being able to compare them than you may realize. What is the true value of preventing damage? In reality, preventing 4 damage from Darth Vader gives us an extra turn with Han or Rey on the board. Not only does this directly give us an additional turn with whoever they decide to target first, but that extra turn spent targeting their first target also gets us an extra turn with our other character later in the game. Even if all we considered was the addition of one turn with Han Solo, what is that worth in terms of our own damage? Using our math from earlier, we expect Han’s average damage to be 2 per die. If that holds true, we are getting 4 damage from Han per turn. Below, I show our damage curve losing Han on the second and third turns, respectively. 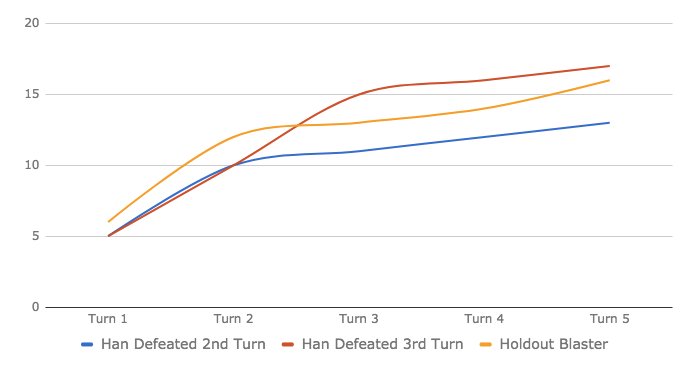 This graph is useful for demonstrating the value of having Han for an extra turn, but does it really let us compare a card like Negotiate and Holdout Blaster? For that, we need one last graph. So, is playing a Holdout Blaster on Rey or Negotiating two of Darth Vader’s dice better? In this particular example, playing negotiate is a better play. Remember though, this exercise was not to determine the exact math behind these cards or even which of these particular cards is better. In our own example, it could easily have been the case that we held a Negotiate and a resource, yet Darth Vader never rolled damage on either of the first two turns. It could also be the case that Holdout Blaster never rolled damage. Even though we may not know which of these cards is better with mathematic certainty, we have a methodology for valuing cards of different types on the same scale. Therefore, we can accurately and fairly compare the different types of cards. It was this understanding that started a complete shift in my thinking about Destiny. In the months leading to Worlds 2017, my methodology for valuing cards evolved my Han + Rey deck from an “aggro” deck into a “control” deck. So, what does this kind of thinking look like when applied to a deck? Let’s take a look at the evolution of my Han + Rey deck to see just that! I started playing Han + Rey when Destiny first released. 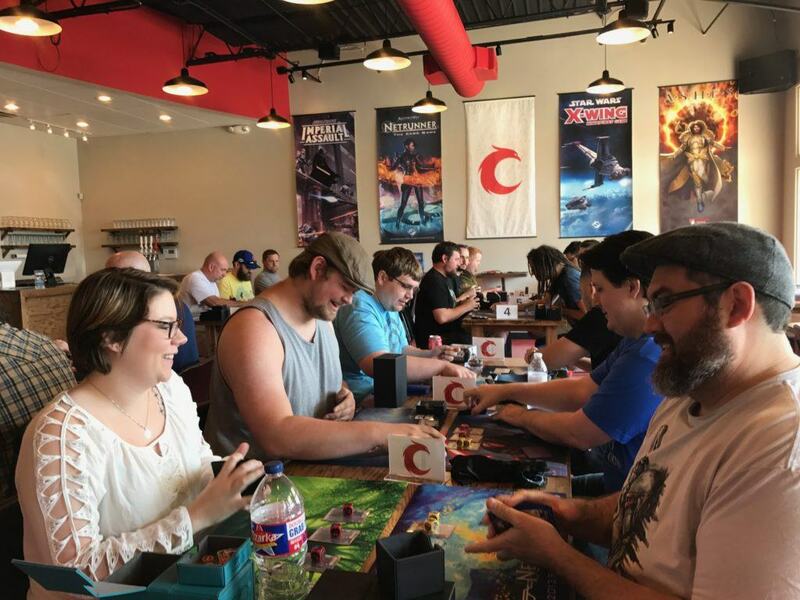 I wrote two tournament reports in the first few months of the game after winning my first and second monthly tournaments at Covenant Tulsa. My Han + Rey deck as of late January is below. This version of the deck had 16 upgrades and 2 supports. That’s nearly two thirds of my entire deck! I used a list similar to the one above against Steven that we have on video. We play with our hands face up in the video below, so you can get a sense for my thinking about the deck and the game at the time. Early on, I was attempting to build my dice pool through upgrades. Pretty standard, really. In most games I opened with a Holdout Blaster (or similar) on Rey. Then I proceeded to stare at the rest of my hand. Guess how many of the cards in my deck could be played on any given turn after I spent 2 resources on an upgrade? Spoiler, it was only three! In one game, I opened with a Holdout Blaster on Rey that I replaced with Jedi Robes (still my favorite opening). I activated Han, attempting to get a 2-disrupt. Instead, I rolled two 3 damage sides. This was another epiphany for me. It hit me like a brick just how bad Han’s dice were when you didn’t have resources. I soon started experimenting with a new style of playing the deck. Whereas before I might add a second upgrade to Rey on the second turn, now I’d overwrite whatever I attached to her on the first turn with an Ambush upgrade. This gave me the benefits of the Ambush upgrade, like extra actions and shields, but it let me activate Han with my first action and either immediately resolve his damage or disrupt my opponent’s resources. After a month or so of playing like this, I started coming to terms with how few dice you need on the table to win a game. 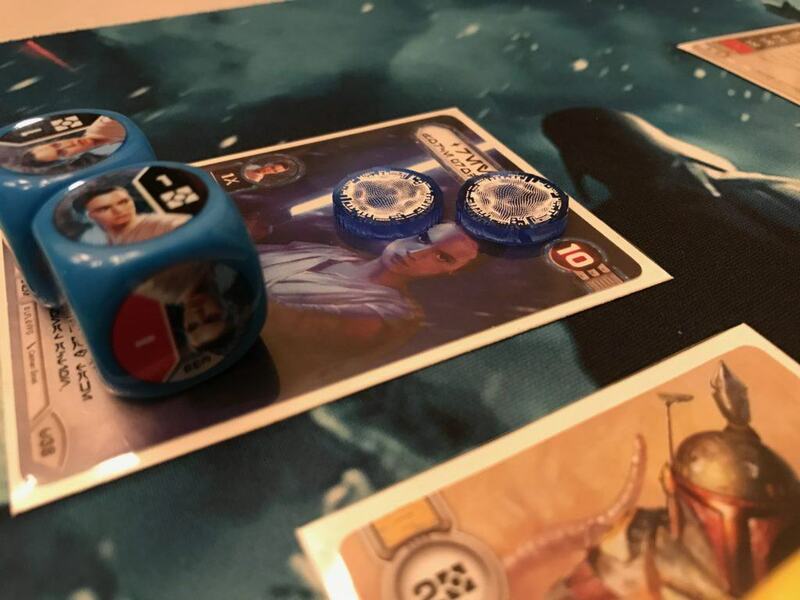 I started valuing 0 and 1 cost cards a lot more favorably, as they offered me incredible flexibility when I didn’t need to use my spare resources on Han’s dice. Overwriting instead of playing an additional Ambush upgrade on Rey significantly increased my damage curve and stopped Han’s dice from being controlled. Soon enough, a lot of the common cards in a Han + Rey deck, like Jetpack and Lightsaber, were replaced with cheaper, always-playable cards like Unpredictable and Heroism. After months of testing, the deck evolved into the list below. When I’m watching games of Destiny, it feels like the players have an unspoken agreement. They spend most of their resources playing upgrades, and since they can’t afford the rest of the card in their hand, they usually discard most of them to re-roll dice. Once most decks spend their two resources on an upgrade, the rest of their cards are just dead weight. It’s not that I believe upgrades have zero value, but that most decks just have too many of them. By reaching a more appropriate balance between upgrades and the rest of the deck, my Han + Rey deck became significantly more adaptable and consistent. I knew going into Worlds 2017 that my theory about the game was either very wrong or very right. Proof was in the pudding, as they say. So, how did Worlds 2017 go with only 8 cards adding dice in my deck? It only took me a handful of rounds in Swiss to realize my foresight about the Worlds 2017 meta wasn’t quite right. Even with a few meta miscalls, my approach to the deck seemed to be reinforced each round. Every time I played Mind Trick out of Han + Rey my opponents would either be amused or confused. I finished in the top 4 of the 2017 World Championship and you can watch my top 4 games below! SPOILERS: If you watch the games, you’ll witness me drawing no upgrades. The penalty for only including 8 dice upgrades is that sometimes you don’t draw them. In testing, I could usually still win the game without upgrades. Nick wasn’t able to do much damage throughout the early turns of either game because of how much control I played. However, he was able to aggressively build his dice pool. This meant when I was drawing cards like Mind Trick, his dice pool was smallest. By the time I was drawing all upgrades, he had a large dice pool and I had little to no control. So, what did I get wrong about the meta? The first thing I got wrong was Jango. Back in March, I expected there to be a significant Jango presence at Worlds. In testing, Jango + 2x Trooper was supremely consistent and I still believe it to be one of the best decks in the meta. An early Jetpack on Jango can be nearly unbeatable. The second thing I got wrong was Vader + Raider. I expected there to be some of this at the event, simply because it was the most viable way to play Darth Vader. I felt very comfortable with this match up because of my heavy control. I could often stop Vader from doing much damage at all through the first two turns, putting me way ahead on the damage curve. Negotiate can be absolutely brutal. The third big thing I got wrong, and probably biggest thing, was Captain Phasma. I didn’t have her on my radar at all. There were a ton of Phasma + Bala + Trooper decks floating around and their style of play is almost the exact opposite of mine. That deck’s ability to buy time with Guardian and build its board is impressive. If I were playing again at Worlds today, I’d definitely make some changes. The first would be to drop a Disarm for a Dodge. Disarm was in the deck for Jango, who as I mentioned was almost non-existent at the event. Dodge is a silver bullet against Jango, but it also would have given me another big control card against Phasma once her board is built. I’d consider going up to two Dodge if I had known how much Phasma I’d see at the event. The second change would be to drop a Scavenge for another copy of Rey’s Staff. Steven specifically turned me on to Rey’s Staff late in our testing process. After using it extensively at Worlds, that card was an MVP every time it hit the board. Scavenge lets me stack a few Ambush upgrades for some insane turns and can get me upgrades when I don’t have any, but I’d rather just more consistently see Rey’s Staff. The final change would be dropping Defensive Stance in favor of Hunker Down. I went down to a single Hunker Down after testing extensively against Vader + Raider. Hunker Down is still a good card even in those bad matches, but against Phasma and Jango it is absurd. Yes, they are. However, I believe most players are currently overvaluing upgrades. This stems from an assumption that upgrades are more important than the rest of the cards in a deck. This assumption is left unquestioned due to players lacking a meaningful way to compare upgrades to the other cards in their deck. This keeps important cards off the table and results in inefficient decks that helps create a stale meta. It is this imbalance that has given rise to the current meta of Star Wars: Destiny. The three cornerstone decks of the meta are Poe/Maz, Palpatine, and Unkar. It seems difficult to prepare for all three of these decks, because they win for very different reasons. However, the benefit of relying less on upgrades and having more options in your hand each round against these decks is significant. 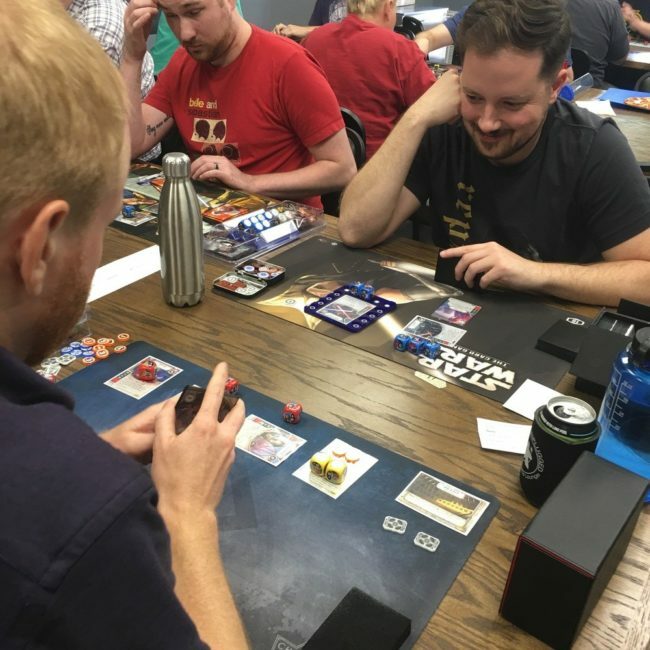 I was able to win the Covenant Tulsa Store Championship (33 players) using a Darth Vader + Royal Guard deck with only 8 upgrades! I’ll be writing about that deck soon. I’ve been calling this way of approaching Destiny the Jedi Path, symbolic of the Jedi belief in having no attachments. If you’re interested in taking your first steps down the path, start by paying attention to the resource and damage curves of your deck. Try a deck with no upgrades and see if you can win games. Then, as you add upgrades evaluate them not just against each other, but against the rest of the cards in your deck. I think you’ll be pleasantly surprised by the results! 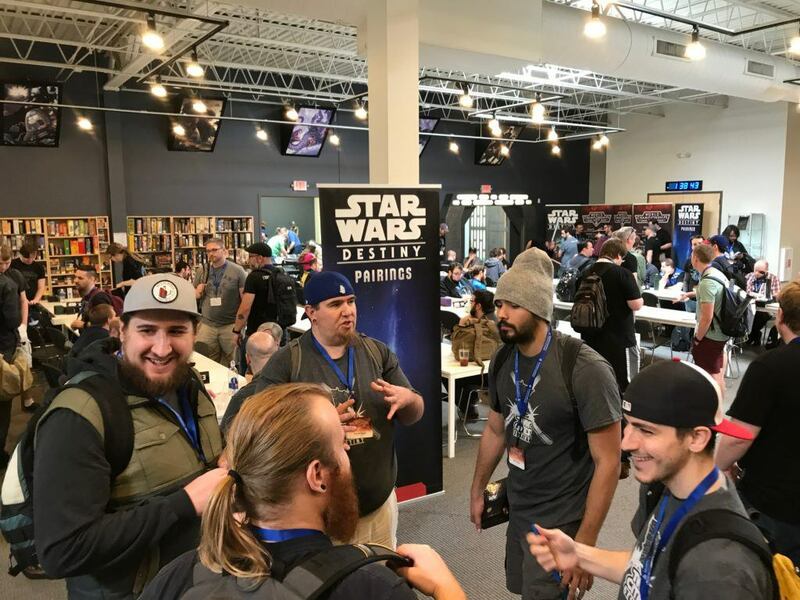 What Will Star Wars: Destiny Become? This blog has been on my mind since I first experienced the full breadth of the Awakenings set. In those early games, certain cards and interactions seemed entirely contrary to the experience that the Destiny ruleset naturally created – and that has not changed over time. After our recent podcast about game balance and the existence of foundational pillars within a ruleset, my grievances with Destiny have reached a conceptual level that is worthy, hopefully, of sharing. If this sounds dire, it isn’t. I absolutely love this game, and believe that it would take multiple sets of entirely flawed cards to break it. 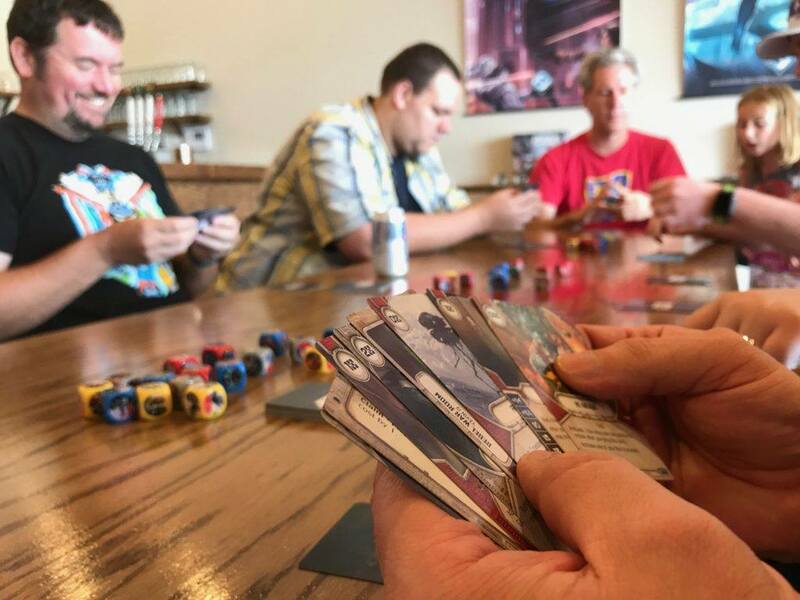 Like Netrunner, the elegance and freedom of its basic rules structure allows it to withstand a beating from the card pool, and its reliance on “random” dice rolls further insulates it from consistently degenerate interactions. We are nowhere near a breaking point. The game is incredibly fun. Too fun, maybe. Instead of complaining about these moments in Destiny, I have spent the past few months asking why they feel so out of place. This is what I have found. Destiny revolves around a long, continuous series of actions traded between players. With each action, a player either increases or decreases their odds of winning. The two win conditions are 1) eliminating all of your opponent’s team and 2) eliminating all of your opponent’s cards – both of which are linked in impressive ways. As I use card effects or discard cards to reroll, I actually advance 2) for my opponent. If I hold cards back in order to prevent 2), my opponent can more easily accomplish 1) due to my not spending cards to control or avoid incoming damage. How I win is a choice that is constantly being calculated. If my opponent spends a lot of cards early, I might choose to focus on defense and control in order to win by eliminating their deck. If my opponent plays conservatively, I might choose to take a few offensive gambles in order to get ahead on the damage curve. In this way, the macro strategy of the game is always in flux – even if my deck is designed for a specific win condition. When we dive further into each individual choice, we find even more flux. The best decision is not always the right decision. While this reality exists in any game with hidden information, Destiny practically begs you to push your luck. A card currently in your hand might single-handedly change the momentum of the game if you hold it until next turn, but spending it now on a reroll might do the same. Resolving a die for damage advances one of your win conditions right now, but rerolling into a resource might give you a much stronger late game. These are all incredibly subjective choices, and each player is free to make them in whatever way they please. Most of the time, it is impossible to determine if a given choice was “right”. I just lost a game because I needed to do three damage on the final turn and only rolled two. What if I had rerolled a 1-damage side into a 2-damage side instead of claiming the battlefield on my first turn? Would I have won that game? Claiming may have been the best choice given the information that I had, but was it the right choice? After every game that I lose, I feel that I could have won had I made different choices. We are arriving, now, at what I consider the foundational pillar of Destiny: adaptation. By luck or design, being in control of the outcome, of your “destiny”, is why this game is wildly addictive and remarkably fun. Feeling in control, even when play revolves around random dice rolls, is the standout triumph of the system. By trading the most basic currency of decision making, the action, back and forth, both players can constantly adapt to changing circumstances. This is absolutely critical. I have Feel Your Anger in hand. My opponent rolls three dice. One of them is blank. I can use Feel Your Anger to remove one of the three dice. I can discard Feel Your Anger to reroll my own dice. I can save Feel Your Anger until my opponent rolls in more dice, knowing that I risk that my opponent could reroll their blank instead. The decision tree off of a single card is massive, and I have five of them. 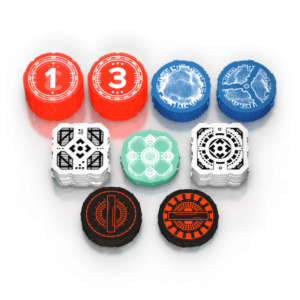 Each die creates a myriad of decisions as well, since each could be resolved as its current side or rerolled into any of its other five sides. Out of all of these decisions, I take a single action. That action affects the valuation of every one of my opponent’s decisions, which are now recalculated and evaluated. My opponent then takes an action. The game flows back and forth, with both players adapting after every single decision. Each has the opportunity to adapt and counter constantly. An unbelievable amount of choices have been evaluated and made by the end of the game, every one of them an opportunity to increase my odds of winning. This is the true beauty of the system. But inevitably, every system can be pushed to failure. If adaptation is the foundational pillar of the game, and oscillating actions maximizes the opportunity for each player to adapt most effectively, then it becomes clear where problems in development will arise. Cards and effects should rarely, if ever, remove the opportunity for an opponent to respond. We know it when we see it for the first time. My opponent plays two Ambush upgrades on Rey and proceeds to take three uninterrupted actions. My opponent rolls ten damage in with Jango and immediately resolves. It is the only time in the game when we feel out of control, when things feel “unfair”. That discomfort, that intuitive sense of “that doesn’t really work that way, does it?” arises when interactions fall outside of our expectations – expectations set by reading the rules, playing Starter games, and reading marketing copy. When those feelings arise, a game has delivered an experience contrary to what was promised. Cards that disrupt the natural 1-to-1 trade of actions, and so remove the ability for adaptation, create these feelings. Take our above example with Feel Your Anger and remove the response opportunity. I have Feel Your Anger in hand. My opponent rolls three dice. One of them is blank. My opponent rerolls the blank. I can use Feel Your Anger to remove one of the three dice. I can discard Feel Your Anger to reroll my own dice. I can save Feel Your Anger until my opponent rolls in more dice, knowing that I risk that my opponent could reroll their blank instead. That decision tree is so much less robust. I will admit that sometimes these kinds of shakeups can be positive. Challenging players to think outside of traditional expectations often leads to exciting new lines of play. Having characters that function outside of our expectations is the easiest way to make them feel memorable and unique. If balanced correctly, cards that limit the ability for an opponent to respond are reasonable additions to the game. Ambush mostly (if not fully) accomplished this right out of the core rules (more below). With this in mind, I have compiled a list of cards that function outside of Destiny’s foundational adaptation principle, and offered up errata that attempts to fix them in the least destructive way. If I could implement all of these changes tomorrow, I would. 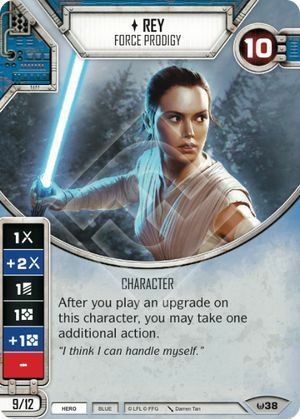 Rey is the most problematic card in the game, and will cause innumerable headaches for future sets. Her ability is the only engine that can consistently generate multiple actions, leading to entire turns with no adaptation whatsoever (not to mention player confusion). A simple line like “Holdout Blaster on Rey (2 actions generated), Roll Han, Resolve 2-Disrupt” at the start of the game dramatically shifts the odds with no chance for counterplay. She severely limits all future Ambush upgrades, and breaks a huge number of interactions that are disproportionately strong when uninterrupted. Suggested errata: After you play a non-Ambush upgrade on this character, you may take one additional action. Explanation: Rey still feels “fast”, and is well worth her cost, but the ability for action stacking is removed. Alternatively, this ability could read “Before you play an upgrade on this character, that upgrade gains Ambush”. The obvious synergy with Han makes that very questionable, but I like that it works within established keywords. Jango is built around the concept of non-response, so he has to be on the list. He severely limits the design space for future Villain upgrades, and disrupts the standard response window. While his ability is somewhat minimized through counterplay, skipping character activations is rarely an acceptable choice. That said, decks that include offensive Supports would provide a strong counter. 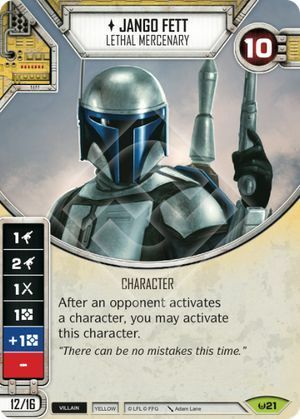 As we get more options for counterplay of this kind, Jango might become less oppressive. Then again, Destiny never promoted itself as a game of “play your favorite supports in a saga-spanning duel between Black Markets and Jawa Sandcrawlers” so Support-heavy decks might not be desired. Suggested errata: After an opponent activates a unique character, you may activate this character. Explanation: Maintains the essence of the ability, but allows for far more counterplay. It also feels much more flavorful, in that Jango is not wasting his time with small bounties. 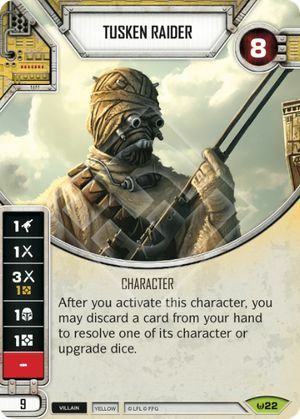 Similar to Jango, the Tusken Raider’s ability is built for non-interaction, with no chance for counterplay. Luckily, with low hit points and a weaker, non-Elite die, the actual impact is minimal. Stacking upgrades like Holocron -> Mind Probe is abusive, but that is a problem with Holocron, which should be errata’d for balance (card restrictions should also always apply, regardless of how the card enters play – but I digress). Otherwise, big upgrades are appropriately risky. The only event that directly provides additional actions, Tactical Mastery creates a moment of non-interaction. Even so, it is appropriately balanced. Costing a card and a resource, with the condition to spot a red character on top, provides adequate counterplay. This card only becomes problematic if you can loop it over and over, or if cards with similar text are printed. Neither of these should happen. We need to talk about the biggest elephant in the room at this point: the Ambush keyword. This core element of the game directly contradicts the “constant adaptation” principle. I have to imagine that its purpose is to achieve the “shakeup” discussed above. It is meant to be a quick, surprise effect that switches up the tempo of the action exchange. As long as Ambush is treated with respect, and balanced accordingly, it does enhance the game. Ambush is perfectly fine on Upgrades and Supports. It speeds up your turn and places a “surprise” option on the board. Cards like Shoot First and Unpredictable are more questionable, but their impact is properly limited by conditions and/or only affecting a single die. It’s a Trap is extremely close to the line, but with its cost, necessity for a “multiple dice in the pool” setup, and reliance on an opponent’s dice symbols, it gets a pass for now (though it likely just should not exist). But then there is Hit & Run. What is the difference between Jango Fett or Tusken Raider, and Hit & Run? The latter is a much more powerful effect. 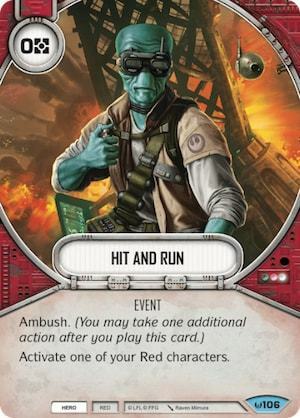 Hit & Run allows you to fully control when you activate (after you have played the upgrades you need, for instance) and removes the opponent’s ability to react to the dice that you roll. This is obviously the intent, but allowing up to 5 dice to hit the table and resolve without any response is simply too much for a 0-cost card. Compared to all of the other Ambush cards, this one is too unconditional and disproportionately powerful without a response window. Suggested errata: Change “Cost” from 0 to 1. Explanation: There is no way to work with the text in order to bring balance. It simply needs to cost more for its potential impact on the game. This puts it in line with Tactical Mastery. Tactical Mastery is less conditional and universally usable, while Hit & Run benefits from Ambush and all future synergies that it affords (Han, etc). In my logical marathon to find the heart of Destiny, I discovered that the constant adaptation between players is critical. Trading actions, the smallest possible transaction in the game, maximizes the potential for each player to overcome random outcomes (dice) with skill. When cards take away this back and forth action trading, that randomness starts playing a much larger role. Likewise, skill takes a backseat. There are a few cards in Awakenings that I would change in order to address this reality. Most of them are characters, simply because those abilities are static and they affect the game every turn. I am not a game developer. I have not tested these changes. They are not designed to provide “balance” between Heroes and Villains. My sole criteria was how severely a card violates the adaptation principle. By limiting cards that allow uninterrupted action sequences, now and in the future, Destiny will more readily empower players to control the outcome of a game – and I find that to be extremely valuable. Sidenote: Spirit of Rebellion does not look promising in this context. 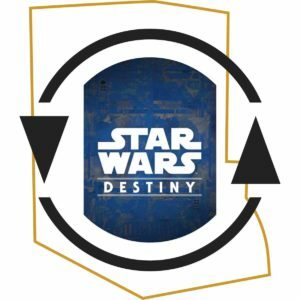 Posted in Star Wars: DestinyTagged Analysis12 Comments on What Will Star Wars: Destiny Become?